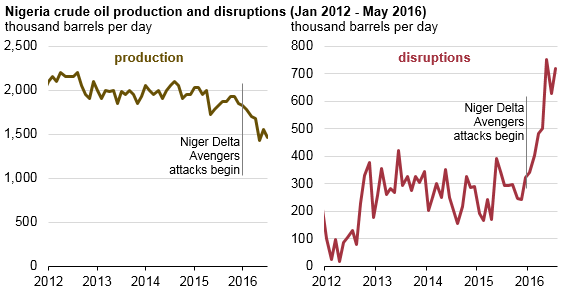 Crude oil production disruptions in Nigeria reached 750,000 barrels per day (b/d) in May 2016, the highest level since at least January 2009. The increased disruptions come as militants continue to focus attacks on oil and natural gas infrastructure in the West African region. Nigeria is a member of the Organization of the Petroleum Exporting Countries (OPEC) and was Africa's largest oil producer until Angola's oil production surpassed Nigeria's earlier this year. 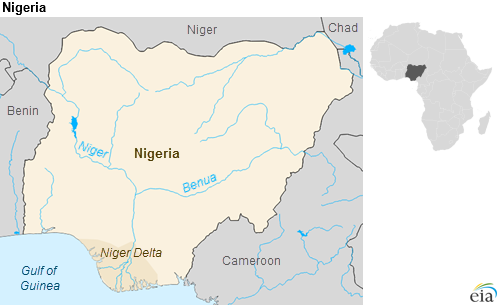 Nigeria's crude oil production disruptions are concentrated in the Niger Delta region, an oil-rich area bordering the Gulf of Guinea that is the mainstay of the country's crude oil production. Since the beginning of 2016, the Niger Delta Avengers (NDA) have conducted many attacks on oil and natural gas infrastructure throughout the region. Although not the only militant group conducting attacks in the region, the NDA is currently the most active. The NDA's attacks have resulted in immediate and severe disruptions in crude oil production, as some of the attacks have targeted key oil-gathering and export infrastructure. Nigeria's oil production averaged 1.9 million b/d in 2015. By May 2016, Nigerian oil production had fallen to 1.4 million b/d, nearly a 30-year low. After some repairs, and in the absence of major new attacks, some of the disrupted production was restored, and crude oil output averaged 1.6 million b/d in June. Despite this recent increase, the continued threat of militant attacks poses a risk to sustained production. The NDA has claimed responsibility for several attacks since the beginning of July, and outages once again rose in July. According to trade press reports, exports of multiple Nigerian crude oil grades, including Bonny Light, Forcados, Brass River, and Qua Iboe, have been under periods of force majeure since the beginning of 2016, meaning companies are released from export obligations as a result of circumstances beyond their control. Significant disruptions in oil production resulting from NDA attacks, combined with relatively low crude oil prices, have had a significant effect on Nigeria's economy. According to Nigeria's Ministry of Budget and National Planning, Nigeria's oil sector provides 70% of government revenue and 95% of export revenue. The NDA attacks are largely in response to President Buhari's cutback on amnesty payments and termination of security contracts to former militants. The group threatens to continue the attacks until the Nigerian government meets its demands, some of which include greater regional control of local oil production, continuation of the amnesty program, and compensation to Niger Deltan communities polluted by oil exploration and production. The Nigerian government announced in June that it had agreed to a ceasefire with the NDA, but the group refutes that statement and has conducted numerous attacks since then. More recently, the Nigerian government announced it will resume payouts to the militants under the amnesty program. However, because payouts are just one of the NDA's many demands, crude oil production stoppages are likely to continue until the Nigerian government and the NDA can reach a comprehensive agreement. EIA expects Nigerian oil production to remain depressed through 2017 as a result of militant attacks. More information about Nigeria's oil production and disruptions is available in EIA's Country Analysis Brief.